S0709. 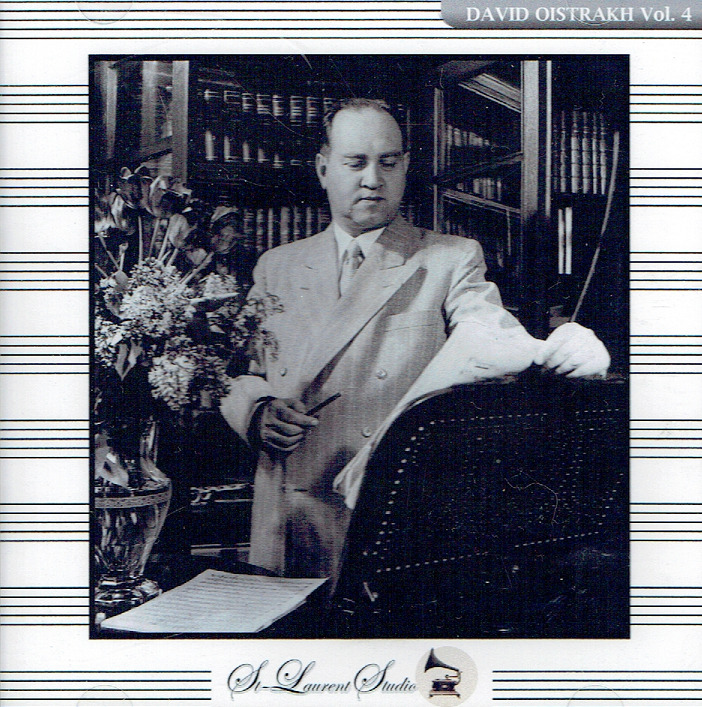 DAVID OISTRAKH, w. Claudio Abbado Cond. Vienna S.O. : Violin Concerto in D (Brahms), Live Performance, 11 June, 1972, Musikverein; w. Laszlo Somogyi Cond. 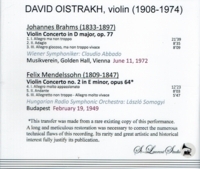 Hungarian Radio S.O..: Violin Concerto #2 in e (Mendelssohn), Live Performance, 19 Feb., 1949. [An outstanding, powerful performance of the Brahms Concerto, one of the most beautiful you'll ever hear; the Mendelssohn Concerto, while also beautiful, is in somewhat inferior 1949 Hungarian b'cast sound.] (Canada) St Laurent Studio YSL T-508. Transfers by Yves St Laurent. 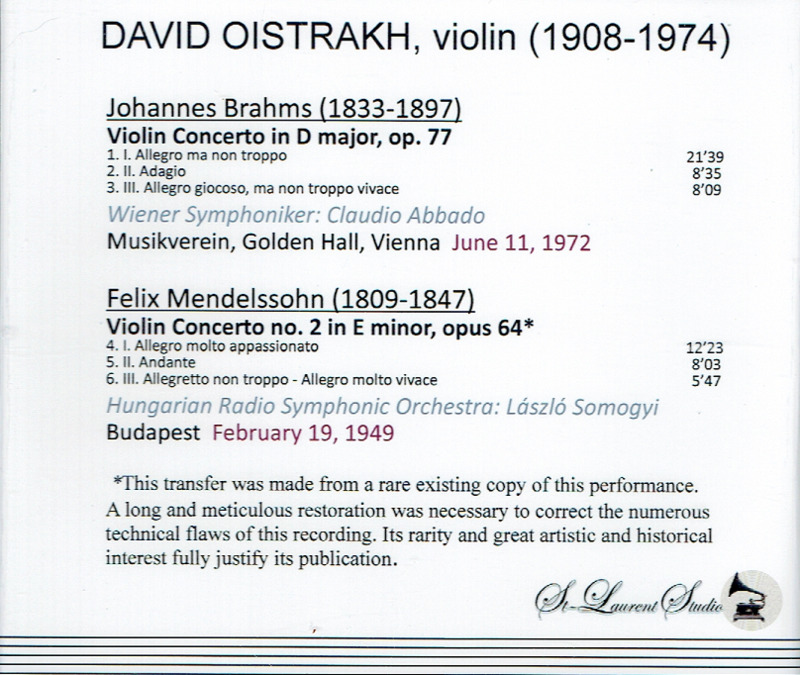 "David Oistrakh is considered the premiere violinist of the mid-twentieth century Soviet Union. His recorded legacy includes nearly the entire standard violin repertory up to and including Prokofiev and Bartók. In 1937 the Soviet government sent him to Brussels to compete in the International Ysaÿe Competition, where he took home first prize. With his victory in Brussels, Soviet composers began to take notice of their young compatriot, enabling Oistrakh to work closely with Miaskovsky and Khachaturian on their concerti in 1939 and 1940, respectively. In addition, his close friendship with Shostakovich led the composer to write two concerti for the instrument (the first of which Oistrakh played at his, and its, triumphant American premiere in 1955). During the 1940s Oistrakh's active performing schedule took him across the Soviet Union but his international career had to wait until the 1950s, when the political climate had cooled enough for Soviet artists to be welcomed in the capitals of the West.